Has it already been 20 years? Now that we are into 2019, I realized that it has already been 20 years since the Y2K fever was starting to sweep the world. I run into people now that have no idea what Y2K was, but in 1999 those of us maintaining computer systems were very busy. Here is a reminder (or primer) on what Y2K was all about. When computers were in their infancy in the 1950s, 60s, and 70s, memory was very expensive. We talked about large amounts of memory in kilobytes (Kb) and megabytes (Mb). Not the gigabytes (Gb) and terabytes (Tb) that are talked about today. This went for both the short term random access memory and the long term disc memory. Don’t forget that a lot of data was transferred by putting in on tape and physically shipping the tape. Anyway, the fact that memory was expensive led to shortcuts being taken. One of those was in how a date was stored. All those 19s on the front of every year were unnecessary. After all, it was always going to be a 19 unless it was a large number like 95 or 96. Those were from birthdays in 1895 or 1896. So, as the year 2000 was approaching, the assumption was failing. Now we were getting those 95 and 96 dates and the birthdays were probably not valid except for those people that lived into their 90s or even became centenarians. But if you looked at the last two digits you knew the person was old. Computers however are dumb. Or at least as dumb as we tell them to be. We were about to have trouble telling if the person belonged in a nursery or a nursing home. This problem wasn’t limited to birthdays. What about things that compared two dates and depended on the information from the most recent of the two. All of a sudden on January 1, 2000 the comparisons would all fail. 00 is less than 99, but 2000 is greater than 1999. The unnecessary 19s were now necessary. Luckily memory was cheaper now and we could store those 19s. But every program that looked at that data had to be changed to look at 4 digits instead of 2 digits. Oh, and we had to go back thorough all the data and put those 19s into it. And when do you do this? All the programs and databases had to be updated simultaneously. Or you had to have workarounds. Some of those would work for a few years. Things like, if the year was stored as 65 it was greater than 40 so attach a 19 in front, but if it was greater than 90 attach an 18, otherwise it was a 20. You see where this is going to be a problem again? The programmer will be retired so, it is someone else that will have to kick the can down the road. There were a lot of people worried about all the things that had logic embedded in to them that was not getting updated. The power grid was going to fail. Communications satellites would fall from the sky partly due to the fact that communicating with them itself was going to fail. We were going to be plunged into a new medieval times. That didn’t happen. Yes, we were very busy making changes to programs and data to handle Y2K but it turned out to be a non-event. You did figure out where the name Y2K came from, right? Year 2000. Of course it always bothered me as a programmer that Y2K has not yet come. K to many people stands for 1000, but a programmer things in binary multiples and K is 1024. So, Y2K will be in 2048. I’m already retired. Someone else will have to kick that one down the road. SO, I thought I should give this blog a rebirth since I decided to drop Facebook. This will give me a place to post some of the photos that I would have posted on that social media outlet. Maybe you didn’t realize that I was no longer a Facebook user. I decided that I was tired of the mindless posts, bickering, and blather. So, I dropped it on October 1, 2018. Now, I just need to remember to post on this blog. I took advantage of the nice weather today and went for a bike ride. No, I didn’t take the recumbent. I took my old mountain bike turned road bike (and not very good as either one). I looked in my library and I don’t even have a recent photo of that bike. I did discover something about early spring riding. Fenders are highly recommended. There are many puddles that are completely across the road and therefore unavoidable. Fenders would have deflected that water back to the road instead of to my back and face. Overall, it was very nice to get out for a ride. The photo is from 2006 and it was September. It was also a rainy day. Today was clear and mild and actually more like the weather we should have had on that day in 2006. I was able to wear a light vest today instead of a jacket. I have a vacation planned for later this week, but I went on vacation early today. 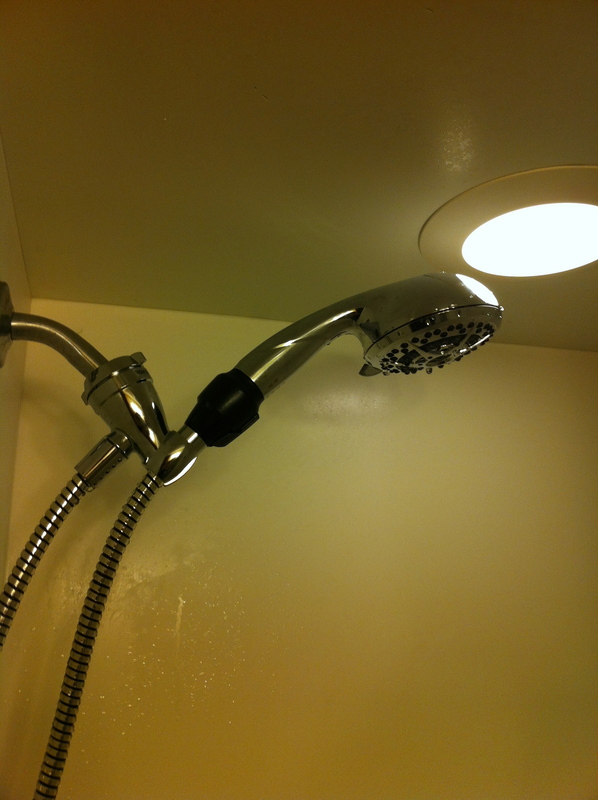 I purchased a new shower head a couple of weeks ago, but never got around to installing it until yesterday. I originally bought it to have a hand-held spray head to help in cleaning the shower. I did prove yesterday that it works for that. This morning I got to find out how nice it is. It has so many settings that I don’t think I got through all of them. Yes, I am sitting in front of a TV waiting for a Packers game to begin. I guess this is what happens when you have a daughter marry a cheesehead. The state parks have reopened! I had a nice hike at Afton State Park today. 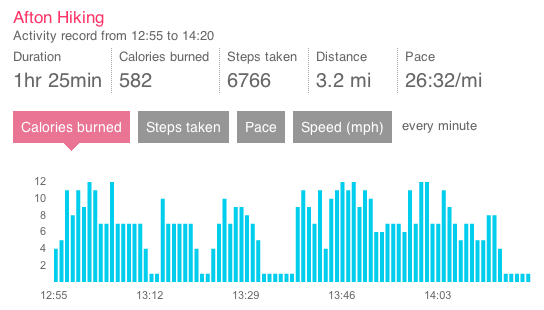 According to my fitbit, I burned 582 calories. I was also wearing a heart rate monitor and it calculated 785 calories. I will use the heart rate monitor number to compute my calorie intake for the rest of the day. 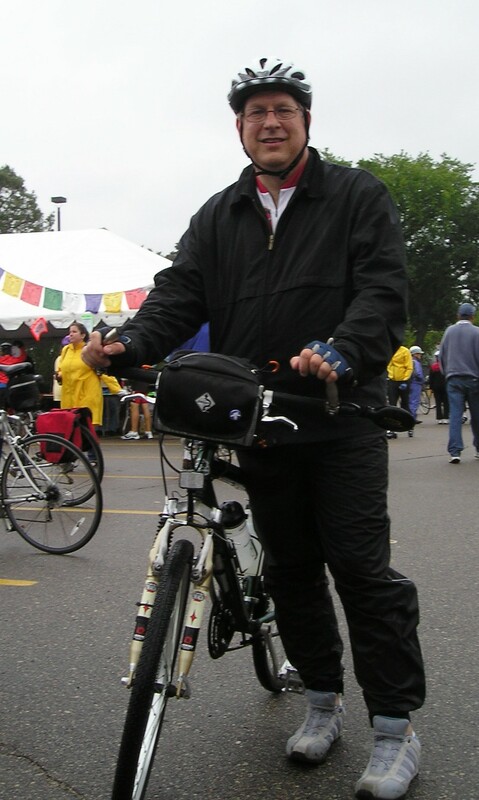 I was able to complete the MS 150 2011 ride from Proctor to White Bear Lake on June 10 and 11. We ended up with a team of 3 riders. Thanks for riding Dave and Pete! Unfortunately, we lost our 4th rider to a traffic accident on her way to the ride registration in White Bear Lake. Both drivers walked away from minor accident, but it kept Kristi from participating in the ride.